Cody Willoughby | AIM Media Midwest Aspire program director Sarah Thomason congratulates, from left, Angela Thornton, Dana Pingleton, Russell Newhouse, Angelica Negrete, Kayla Kruchkow, Christy Hilleary, Jessica Geer, and Kyle Calvert, who graduated from the program on Thursday at UVCC in Piqua. 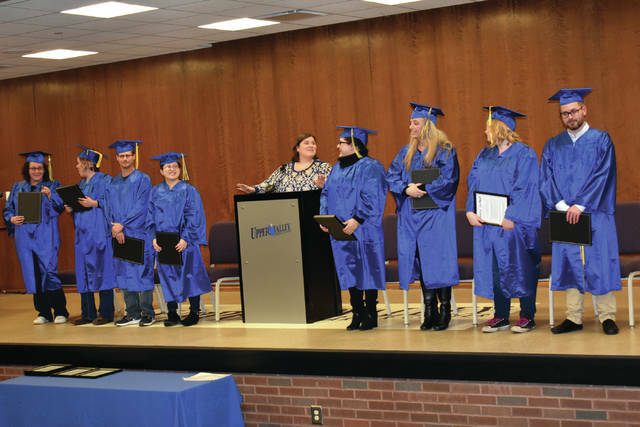 PIQUA — Eight students from the Upper Valley Career Center Aspire program made their academic ambitions a reality on Thursday during an official graduation ceremony at UVCC. Guest speaker T.J. Armstrong, Aspire Program Director at the Ohio Department of Education, congratulated the graduates on their success, and offered words of encouragement on the potential for their futures. Armstrong, along with Upper Valley Career Center Adult Division Director Scott Nail, awarded each student their diploma. Those in attendance represented 11 students in total graduating from the program this month. Aspire currently offers over 500 class sites across all 88 counties in Ohio, with over 50 fiscal agents representing students. Based on data from the U.S. Department of Education’s Office of Career, Technical, and Adult Education, Aspire’s services rank second in adult basic education, eighth in English as a second language, and third overall in nationally-ranked student performance. In 2018, approximately 28,918 students were enrolled with Aspire, with 2,260 Aspire students earning a diploma. 79 percent of students who completed all sections of an HSE test earned their diploma in 2018. Annual expenditures average $719 per student. Ohio aims for 65 percent of its adult population to have a degree, certificate, or other post-secondary workforce credential by 2025. The Aspire program plays a crucial role in reaching this goal by preparing adults for post-secondary training. UVCC’S Aspire program will tentatively hold its next GED graduation on Thursday, June 27. For more information, visit www.ohiohighered.org and www.uppervalleycc.org. https://www.dailycall.com/wp-content/uploads/sites/30/2018/12/web1_GED1.jpgCody Willoughby | AIM Media Midwest Aspire program director Sarah Thomason congratulates, from left, Angela Thornton, Dana Pingleton, Russell Newhouse, Angelica Negrete, Kayla Kruchkow, Christy Hilleary, Jessica Geer, and Kyle Calvert, who graduated from the program on Thursday at UVCC in Piqua.